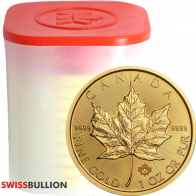 Buy Canadian Maple Leaf gold bullion coins from SwissBullion.ch. 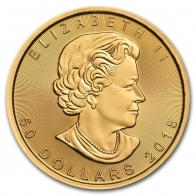 The Maple Leaf gold bullion coin is available in one ounce, half ounce, quarter ounce and tenth ounce sizes, and may be purchased individually or wholesale. 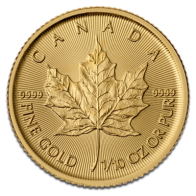 Maple Leaf gold coins contain 9999 fine investment grade gold bullion and are manufactured by the Royal Canadian Mint. 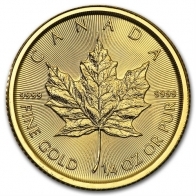 Canadian Maple Leaf gold bullion coins are available in current year and backyear versions. 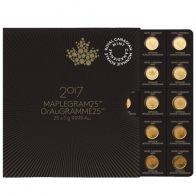 The Canadian Maplegram bar is also available. 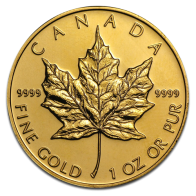 The Royal Mint also manufacture Maple Leaf gold bars for investors. 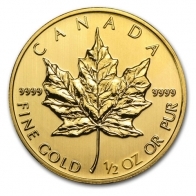 The Maple Leaf series is available in gold, silver, platinum and palladium. 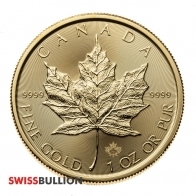 Gold Maple Leafs may be purchased for delivery or for VAT-exempt secure Swiss storage.